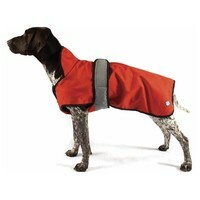 Danish Design 2 in 1 Reflective Dog Coat (Orange) is a fantastic convertible coat that is suitable for wearing all year round, in any weather situation. Made with a waterproof, windproof and breathable outer shell, this durable coats main feature is the polar fleece liner that can be removed during warmer weather or added in the winter months. Easy to use reflective velcro straps hold the coat in place, while the integrated chest protector ensures your dog's underside stays dryer and warmer in any situation. To ensure an accurate fit, measure from the base of the neck to the base of the tail. Delivered quickly to Germany. Packaged well. Size 12 fits my Smooth Fox Terrier well. A nice thick coat with the lining, seems very warm. Handy to have the option to remove the lining for those wet warm days. Polly tolerates it well, which surprised me! A good coat at a good price. Good looking coat and I like the fact that it can be used all year round as the fleece can be removed. I hope the color and quality will stay the same after few washes. I've bought a few coats in the past for my smaller Border Terrier but this is the best. The fit is perfect and the leg straps help keep it snug and in place. Unlike some coats the velcro strap fastens at the top - clearly designed by someone who actually walks a dog in wet/muddy conditions as you don't have to fumble about underneath when you get home. The 2 in 1 idea is good too though I haven't needed the fleece yet. The chest protector was what I was after and it works superbly - keeping off grime and oil from my sensitive-skinned dog. The only drawback is that in pouring rain the water gets into the velcro strap somehow and although the dog stays dry the rain pours out when you take the coat off. Also, I bought a bigger version for my male Border and he hates it because of the leg straps - you can't win!